Alabama beat Penn State in Tuscaloosa last year 24-3. It was a great game that for the most part (maybe not the fumble on the interception), and should give a good idea of how this year's team will look come fall. Of course, Marcel Dareus, Greg McElroy, and Julio Jones are among those not in this years cast, but the cupboard isn't bare in T-town. I thought Joe Paterno showed great class following the loss for his Nittany Lions. He is a legend of the game much like Bear Bryant. They were cut from the same cloth you could say. 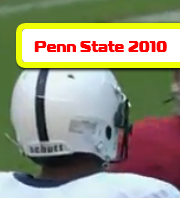 Anyway, check out the video on the Alabama verses Penn State 2010 Highlights. Richardson ran the ball great and the defense looked great. Very good game for Alabama. Looking forward to the game this year. Word is that Nittany Lion Stadium will have a "white out" where all the fans will wear white. Sounds gimmicky and Bama already stomped out a "Black Out" in Georgia before. Man I can't wait!